Lavender French Essential Oil - Sweetgrass&Rain Inc. 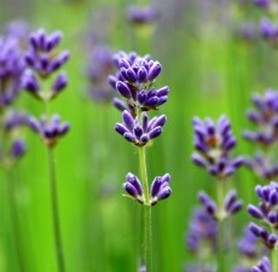 The Lavender plant is a woody evergreen shrub, up to 1 meter tall, with pale green, narrow linear leaves and violet blue flowers. The entire plant is covered with oil glands, which are in the star shaped hairs that cover the plant. Lavender has been used since ancient times, and the Romans added lavender to their bath water, hence the name from the Latin lavare, 'to wash'. French Lavender Essential Oil has a strong floral powdery scent that smells like the fresh lavender of the region. Blends With: Bergamot, Chamomile, Citronella, Clary Sage, Geranium, Lemon, Orange, Palmarosa, Patchouli, Rosemary, Rosewood and Ylang-ylang.